You can buy an unlimited amount of vouchers per transaction, all guests will be sat together. Each voucher is valid for admittance to a Friday show in March and April 2019 at The Covent Garden Comedy Club. The guest can book their own tickets for a show by using the voucher code or email us on: comedybookings@yahoo.co.uk and we can book them in. The Covent Garden Comedy Club @ Heaven has been making London laugh since 2002 and is the biggest and most successful independent comedy club in Central London with the best acts in the business. Dress code. Come as you are, Age 14+ with valid ID and Under 16's must be accompanied by an adult. There are stairs at the venue and unfortunately no disabled access. Capacity of the Venue is 260. The shows regularly sell-out, early booking is advisable. 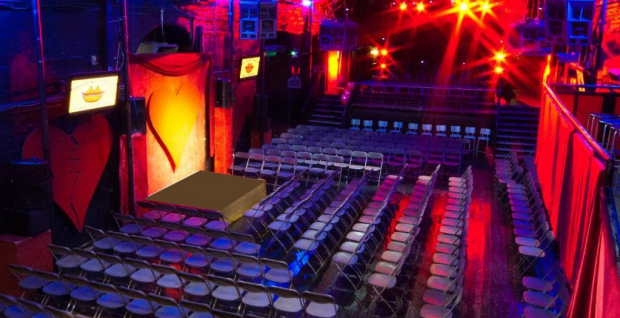 Seating is theatre-style, seats are pre-allocated and reserved for you until you arrive. Every comedy ticket includes a free shot and entry to Mabel's nightclub located on Maiden Lane, a 5 minute walk away, just off The Strand. Collect your voucher on the way out of the Comedy Show. Mabel's is a strictly 18+ venue, smart casual dress code. Open till 1AM! This voucher is valid only on Friday nights in March and April. Shows are subject to availability. The voucher is not valid on our Valentines Show or NYE and can only be redeemed once.